Neoprene Queen is the Best 1st Aid for Waterproof Neoprene Items. With this Neoprene glue, any rips in your neoprene waders, wetsuit or wellies can be quickly repaired on the bank, with or without a patch, allowing you back in the water in under 10 minutes. 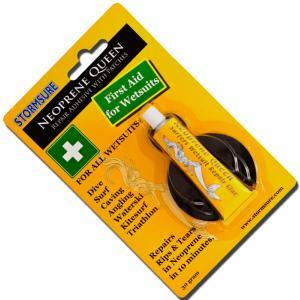 Neoprene Queen can be used in conjunction with Stormsure Flexible Repair Adhesive, which is applied over the damaged area to increase strength and durability. Perfect for rips, holes, splits, open or un-stitched seams.A quick drying black neoprene based contact adhesive which is better value than Black Witch. - 5 circular neoprene patches. - Easy to follow instructions. Keep it in your kit bag if you are a diver, angler, surfer, body boarder, kite surfer, or sailor. This product works on any item made from neoprene, but works on many other fabrics and materials too. No leaks in my waders now. Excellent product. repaired my neoprene waders like new! !